Pandemonium broke out in the Idiroko end of Ikorodu Road, Lagos State, on Tuesday after two policemen attached to a bank in the area reportedly unleashed terror on two officials of the Lagos State Traffic Management Authority. The traffic officers were allegedly beaten up for arresting a mobile policeman, who had reportedly violated the state traffic law. PUNCH Metro learnt that trouble started when the mopol, who was in a KIA vehicle with number plate, GW 113 AAA, allegedly drove through the reserved Bus Rapid Transport lane. 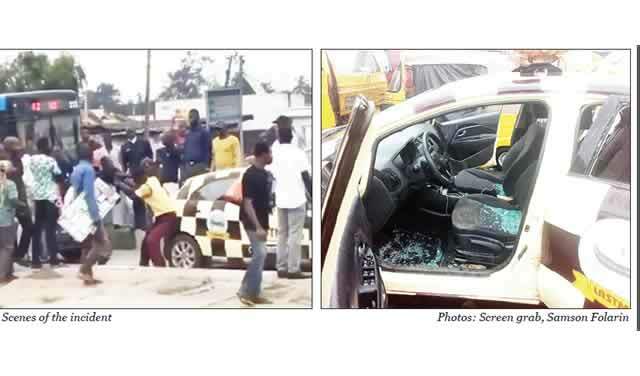 He was reportedly blocked by the LASTMA officials, who were in a branded KIA, with number plate, RTN 198 LA. The policeman’s car key was allegedly seized by the traffic officials, who insisted he would face the consequence of his action. In the ensuing argument, the two policemen who came from a bank opposite the scene, allegedly beat up the officials, vandalised their vehicle and aided the escape of the cop. A clip of the incident, which went viral on the social media on Tuesday, showed the moment the armed policemen kicked and punched one of the LASTMA officers. A man, who identified himself only as Jerry, said the mopol caused a traffic jam on the BRT lane while resisting arrest. He said, “The incident happened around 9.30am. The motorist wore a police shirt which had mopol on it. He was coming from Maryland en route to Anthony and took the BRT lane. He was blocked by a LASTMA vehicle at Idi iroko. PUNCH Metro obtained another clip of the incident showing the mopol saying the officials “scattered” his car. “If you arrest me, must you scatter my car? Why will you scatter my car?” he queried. Our correspondent learnt that two hoodlums, who allegedly joined in aiding the escape of the policeman, were arrested and arraigned before a mobile court. The men were reportedly remanded in prison. The Public Affairs Officer of LASTMA, Mahmud Hassan, expressed disappointment in the conduct of the cops. He said, “Our men were on their lawful duties on the Ikorodu Road, manning the BRT corridor, when the motorist was seen driving on the BRT lane. “When accosted by our men, he said nobody could stop him from driving on the BRT lane. At that point, our men told him that he was not above the law. The motorist started making trouble with our men. “When the policemen manning the bank opposite the scene of the incident saw him, they crossed the road and in a bid to free the man from the hands of the law, they descended on our men. They beat up our men black and blue, tore their uniforms and damaged our vehicle. They chased our men away and used force to take the vehicle from the BRT lane. The injured officers are receiving treatment as I speak. The state Police Public Relations Officer, CSP Chike Oti, said the Commissioner of Police, Edgal Imohimi, had ordered an investigation into the incident. He said, “There is no report of the incident in any of the station in the area. The information we got was that the matter was not reported because the men settled their differences amicably.